This recipe really works best when made in a food processor but I have also made it in my stand mixer. I don’t think it would turn out very well if mixed by hand because the cheese wouldn’t blend properly. 1. In a food processor or stand mixer fitted with a paddle attachment, combine the flour, salt and baking powder. Whir them together (or beat them in mixer), until the dry ingredients are well mixed. 2. Add the butter and cheese and continue to beat or process until a dough forms. Separate the dough into two balls and wrap each of them in plastic wrap. Flatten the dough balls into disc shapes and chill in the refrigerator for about 30 minutes, or until it has firmed up. While dough is chilling, preheat the oven to 400 degrees. 1/8 inch thickness. Cut into 1-inch squares with a sharp knife, or cut into desired shapes with cookie cutters, placing crackers on prepared cookie sheets. I also poked a hole in the center of each cracker with a chopstick to make them look more like cheez-its, but that is entirely unnecessary. Gather together any remaining dough scraps and roll out again, cutting into desired shapes. Baked at 400 degrees for 10 minutes, or until lightly browned. Repeat with remaining disc of dough. 4. 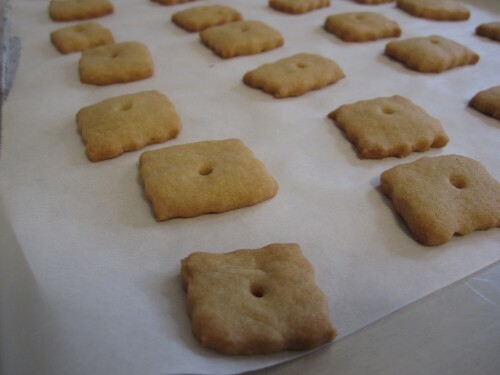 Allow the crackers to cool to room temperature before storing in an airtight container. Will stay fresh for about 1 week. These crackers take a little over an hour to prepare (including half an hour for dough to chill) and they were worth every second! I loved that they had a big cheesy flavor without being overly salty. They were not quite as crunchy as Cheez-its, or quite as orange, but they had a wonderful, flaky texture. The real test, or course, was whether my daughter like them. Amazingly, she actually seems to prefer the homemade crackers to cheez-its! She ate all the homemade crackers, leaving cheez-its uneaten on her plate; an unprecedented occurrence. This may partly have been influenced by the fact that she helped me roll and cut the crackers so she felt like she had made them herself. But there is one of the advantages to homemade cooking, especially for children, they get to see how food is made and participate in the process. 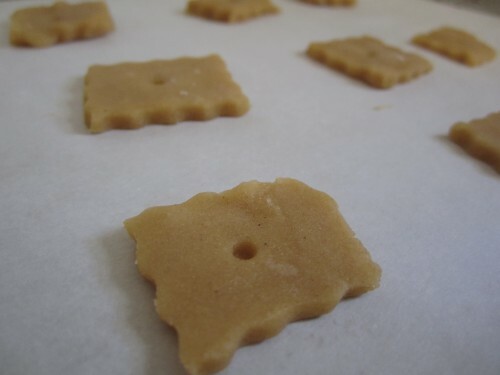 The Cheesy Cracker recipe is a great one to make with children. The process is similar to making sugar cookies so kids can help you choose cookie cutters and cut the crackers out, just like with cookies. The one downside to the homemade crackers is price as they cost about 3 times the amount of store bought cheez-its. However, neither type of cracker was especially expensive. Bottom Line: Homemade Cheesy Crackers are delicious and made with all-natural ingredients. They had a cheesy flavor and crunchy texture that appealed to my toddler and the adults in our household. 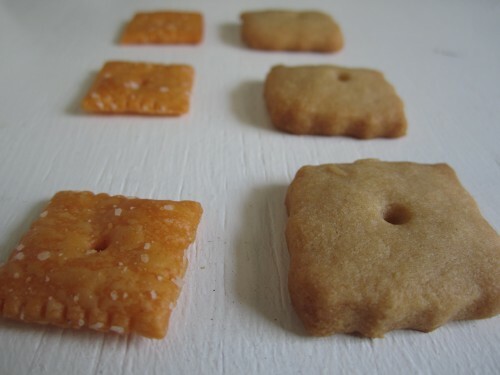 However, they do take quite a bit of effort to make and cost 3 times the amount of boxed Cheez-its, making them a less convenient option. Site Copyright © Cook it Fresh 2019. Cook it Fresh is powered by WordPress + HTML5 Boilerplate.